The DFHRS research project of the Hochschule Karlsruhe - University of Applied Sciences (HSKA) aims at the parametric modelling and computation of height reference surfaces (HRS) from geometric and physical observation components in a hybrid adjustment approach (DFHRS). The access to the parametric HRS model is enabled by DFHRS data-bases, which allow the direct conversion of GNSS-heights h into physical standard heights H. DFHRS data-bases are used for online GNSS-heighting in DGNSS-networks (SAPOS, ASCOS etc.) and in GIS, and have been computed for different states in Germany as well as several nations and regions in Europe, Africa and USA. 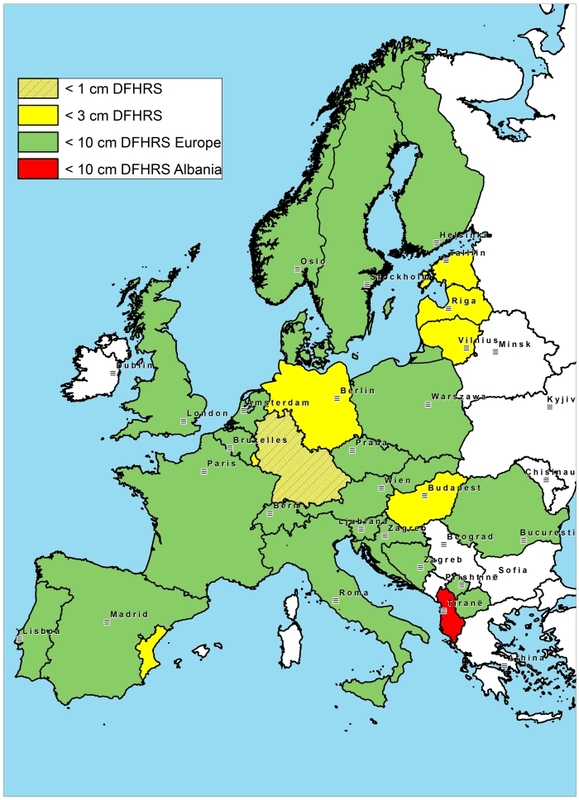 Overview of DFHRS-Europe and high precise DFHRS within Europe. Copyright: Reiner Jäger. Legal Notice. Design by Simone Kälber.